The Church of Earthalujah! has pulled it off again, this time in Swarthmore, PA. On Saturday morning, residents of the quiet town were greeted by a theatrical convergence in the local PNC Bank branch, when Reverend Billy and his Stop Shopping Gospel Choir teamed up with Swarthmore College students and community members to call attention to PNC’s dirty financial practices. Over sixty people went inside the bank and filled the lobby with cries of ‘Save the Mountains!’. Performance activist Reverend Billy preached against Mountaintop Removal (MTR) coal mining, a practice that destroys mountains, causes cancer and health problems in Appalachian communities, and has already buried thousands of miles of streams. Demonstrators waved messages of ‘No More MTR’ and ‘Bank Like Appalachia Matters,’ and the Gospel Choir sang anthems. 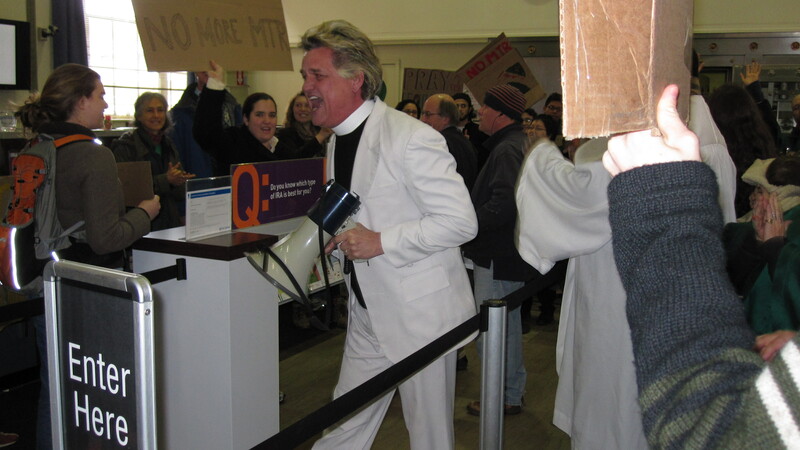 When police were called to ask the group to leave, Reverend Billy moved the impromptu congregation outside and led them in song in front of the bank. Interested passersby stuck around to watch the show. Anjali Cadambi is an artist, activist and student at Swarthmore College.